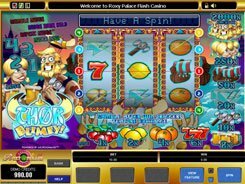 Online Slots Slots Games Directory Microgaming Abra Kebab Ra! 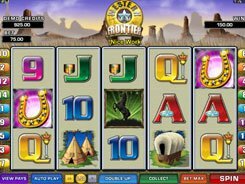 This seemingly simple video slot powered by Microgaming has an array of features. The three-reel one-payline Abra Kebab Ra! 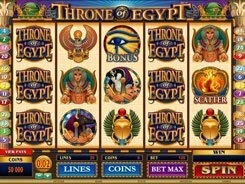 slot machine is a fantastic mix of two themes: Arabian cuisine and Arabian fairytales about genies. In this slot, genie is the most rewarding symbol, with these three paying out your bet multiplied x1000 times. 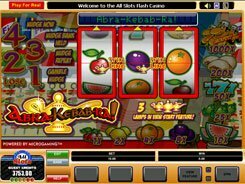 On the reels, you will see traditional fruit symbols of cherries, lemons, oranges, plums and watermelon segments awarding up to x10 for three of a kind. The second-largest jackpot of x500 times your stake is granted for three spicy mouth-watering kebabs. A wager per line, per spin varies from $0.1 to $10. So if playing at max, the jackpot may reach as high as $10,000! 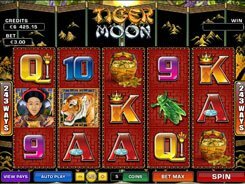 Watch out for golden lamps as three trigger the Abra Kebab Ra bonus feature with reel Nudges and Holds for even more sizable winnings. During the bonus feature, you can grab sky-high multipliers and extra spins. 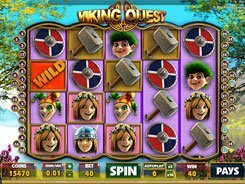 This atmospheric slot has no scatters and wild symbols, yet it will be your new favorite thanks to its visually stunning design and a plenty of high-octane gaming action. PLAY FOR REAL MONEY! slots similar to Abra Kebab Ra!